INDIANAPOLIS — At 10 p.m. last Thursday, two men waited outside Room 135 at the downtown Crowne Plaza: Dolphins quarterbacks coach Bo Hardegree, and one of the 18 quarterbacks at the NFL combine. “No, number four,” said the player, who wore a credential around his neck listing the schedule of interviews he’d take with teams. Then he smiled and suggested that maybe this would be his best one yet. A few seconds later, this backpack-wearing, NFL-hopeful walked into a dimly lit hotel room to be grilled for precisely 15 minutes by a group of 10 Dolphins employees that included Mike Tannenbaum, the executive vice president of football operations, general manager Chris Grier, head coach Adam Gase and Hall of Fame quarterback Dan Marino. The combine has turned into a made-for-TV event each February, with 334 prospects wearing league-issued workout gear while they are put through an on-field skills and athleticism contest. But the most valuable information is often gleaned behind closed doors during formal player interviews. Teams can schedule up to 60 of these private meetings during the week. They take place each day between 6 and 11 p.m. on the first floor of this hotel across the street from Lucas Oil Stadium. It’s an NFL gantlet, with all 32 clubs setting up in adjacent hotel rooms, each door adorned with a team banner. Access is tightly restricted by local police officers, who are stationed at every hotel entrance and are under strict orders to let only team employees and combine players enter—no agents, no sponsors, and no personal trainers are allowed. A few steps away from the hotel’s indoor pool, their room wedged between the Patriots and Raiders, the Dolphins had already conducted 16 formal interviews by 10 p.m. on Thursday. Every 15 minutes, a new prospect took over the hot seat, with no breaks in between. Miami’s tiny room was filled to the brim with people and furniture and equipment, and when their 17th player arrived for his interview, a crash reverberated throughout the room—something fell to the floor as everyone jumped up to greet him. “I apologize,” the quarterback said, looking around but unable to determine what fell. The handshakes and nice-to-meet-yous belied what was about to unfold: an interrogation. By this point in the Dolphins’ scouting process for the 2016 draft, they’ve already visited 230 colleges, graded 1,344 players and written 5,885 total reports since last spring. In a very long election process, the combine is tantamount to one precinct reporting. The formal interviews, however, are one of the most intriguing elements, at least to outsiders trying to find out what goes on behind closed doors. Which players are interviewing with which teams? Who interviewed well? What crazy questions are being asked? For a look at what one of these job interviews is like, The MMQB sat in on the Dolphins’ 10 p.m. meeting with the quarterback. So as not to affect the draft process for either the player or team, we are not disclosing the quarterback’s name. One 15-minute interview will never be the sole reason that a team pursues or passes on a player. But it’s an important data point that can help teams decide if they need to do more work on the player before the draft, and then set their Pro Day schedule accordingly. And for juniors who declare for the draft, combine interviews are the first chance for teams to sit down with these players face to face. The Dolphins already have a quarterback, Ryan Tannehill, whom they gave a $95 million contract last offseason. But teams schedule formal interviews with players in virtually every position group, seizing the chance to vet prospects for a number of potential roles—starter, back-up, developmental project, future free agent, opponent. After hiring Gase to be the new head coach and promoting Grier to general manager from college scouting director this offseason, the Dolphins are trying, yet again, to redirect the franchise. During 13 days of meetings in February at their headquarters in Davie, Fla., the personnel department and the coaching staff talked about what kind of players they’re seeking. Two attributes kept coming up: Competitive guys who love football. In Room 135, the Dolphins were trying to find out who best fits that mold. The quarterback, wearing his combine-issued sweats, settled into a chair across the table from the three top decision-makers: Grier, Gase and Tannenbaum. To the player’s right was a computer hooked up to a TV, with one of his college plays queued up on the screen. To his left, a whiteboard. Hardegree, sitting next to the TV, held the remote. Behind him Chase Leshin, the team’s player personnel coordinator, took notes on a tablet that he’d email out at the end of the night. Seated in a semi-circle on the other side of the room: player personnel director Joe Schoen; senior scout Terry Bradway; offensive coordinator Clyde Christensen; national college scout Adam Engroff; and Marino, who, as a special advisor to team president Tom Garfinkel, was party to the entire combine player evaluation process from 7:30 a.m. weigh-ins to the nightly interviews. Marino had attended the Senior Bowl, where one particularly star-struck quarterback asked for a picture during his Dolphins interview. The Hall of Famer also watched film with the scouts and coaches during pre-combine meetings that often lasted more than 12 hours. Earlier this offseason, he asked Grier, “Do you mind me sitting in?” To which Grier told him to stop asking and just keep coming. 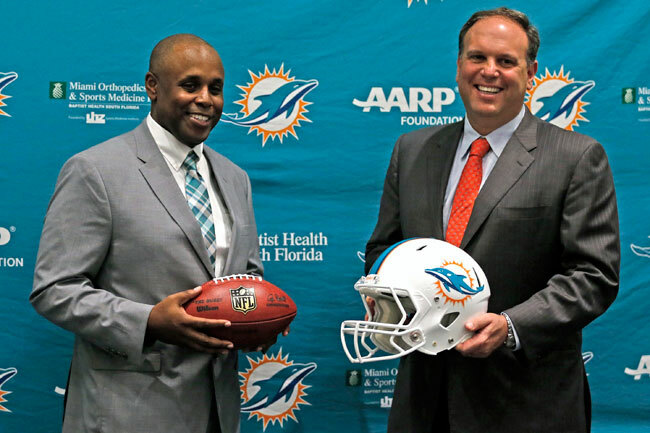 “He takes no shortcuts, and obviously he could, but he’s all in with us,” Tannenbaum says. Grier immediately took charge with a rapid-fire Q&A session. They were already on the clock, and there was no time to waste. Team brass brainstorms questions for each player in advance, based in large part off the reports written by the area scouts. Players today are more prepared than ever, and this quarterback was no different. He responded to the first question with a 274-word opening statement of sorts and took 91 seconds off the clock. He talked about each of his family members; who his role models are; mentioned twice how he was fortunate to have a “great upbringing”; and explained the way he handled a tough decision in his college recruiting. There’s a story in scouting circles about one first-round pick a few years back who filibustered for the entire 15-minute interview, only allowing teams to ask a single question. Over the next six minutes and seven seconds, Grier fired off 16 questions. They covered topics like what the player’s learning style is, whom he hung out with in college, and how he plans to use his college degree. “Play football, for now,” the player said, grinning. “Tell us about your leadership style,” Grier said. He’d also clearly prepared a thorough explanation of his injury history. For 45 seconds, he described each injury he’d had in college, how many games he missed as a result, and whether or not he still had any restrictions today. This player hadn’t had any concussions, but for players who have, finding out the number and recovery time for each has never been more important to teams. There were no oddball questions in this interview. A report last week said that one team had been asking players, “Do you find your mother attractive?” but that’s not a question coming from the Dolphins. Six years ago, the organization found itself in the middle of controversy when former GM Jeff Ireland was reported to have asked Dez Bryant during a a pre-draft visit if his mother was a prostitute. Ireland later apologized to Bryant, and since then, teams have been reminded that federal, state and local employment laws prohibit teams from asking questions that could lead to discrimination in hiring. Teams won’t ask a player if he uses drugs, for example, but instead may ask him to explain why he was suspended in college or say simply, “Is there anything you need to tell us?” For a player with pressing off-the-field questions, such as Ole Miss defensive lineman Robert Nkemdiche, who in December fell out of a fourth-floor hotel room window and was subsequently charged with marijuana possession, teams would likely ask him to explain what happened right off the bat and use most, if not all, of the 15 minutes to get his answers. The quarterback we sat in with did not have any off-the-field issues, not even an unpaid parking ticket, so the temperature in the room stayed pretty mild. Even so, the Q&A felt like a game-show lightning round, with no time for small talk or pauses. The player still knew how to play to the room. At one point, he listed the NFL quarterbacks he likes to watch on film: Peyton Manning, Tom Brady, Aaron Rodgers, Drew Brees and Matt Ryan. Suddenly, eight minutes into the interview period, Grier switched gears. “Let’s talk a little football,” he said. “All right!” the player replied. Grier turned the show over to Hardegree, who had spent the previous six days compiling a reel of eight to 10 college plays for each quarterback the Dolphins scheduled an interview with at the combine. In some ways, this is the most revealing part of the formal interview, because everything else can be scripted. But during the film session, team brass can see if the player is confident based on his recall of plays from a few months ago and how fast he processes what he’s seeing. The Dolphins like to start with what Grier calls a “sugar play,” a play on which the player performed well and that will get him talking. For this first play, Hardegree picked a throw from the opening drive of a game played against a conference opponent last October. Five seconds later, the player rattled off the play call. There was an alert on the play, he explained, in which he sent the tight end to the field side (wide side) of the formation, instead of the boundary (short side), preparing for a possible blitz. The opponent was in a two-high defense, and the quarterback’s key was to read the middle linebacker, to see if he followed the running back buzzing out to the right side. He did, which meant that the quarterback might have a good matchup on the top of the 2 x 2 formation, where his ‘X’ receiver was running a slant and the slot receiver was running a speed-cut in-route. The weak-side linebacker chose to stay with the ‘X’ receiver, so the quarterback threw to the slot guy for a 10-yard gain. “What if it was not two-high?” Hardegree challenged. From the other side of the room, the offensive coordinator jumped in with a question. That back-and-forth took 2:10. Then, Hardegree skipped to the second play in his reel. “Go through the progression while you see it,” he instructed. This next play was a second-down pass a few snaps later on the same drive. The quarterback started describing the routes each of the three receivers were running on the strong side of the formation: double post routes, and a deeper route that was flattened off to a sail route because the cornerback was in the receiver’s way. He completed the pass, but something hadn’t gone quite right. “Which you got later in the game,” Hardegree said. “No check-down; what is your protection?” Hardegree asked. The quarterback made a tough throw, across the hash marks and over two linebackers to the receiver running the sail route out to the far sideline, completing the pass for a 16-yard gain. “Say your sail route falls down,” Hardegree asked. “What are you going to do with the ball here? Two more minutes off the clock. Next play on the reel. It’s from another conference game played last November. This is the quarterback’s first two-minute warning in the NFL. An air horn is blared on the first floor of the hotel, signaling to all the teams that the current 15-minute interview slot would end in exactly two minutes. Hardegree kept going, firing questions more quickly. He wanted to know what the quarterback was telling the offensive line, and how this protection was different than on the second play he’d showed him. “What were you thinking here?” Hardegree continued. Hardegree: “And what’s this route called down at the bottom? The quarterback kept talking, rattling off the pass protection and assigning each offensive lineman to a defender, but time was up. The 10 men in the room stood up to signal the end of the interview. Gase was first to reach his hand out for a handshake. “Good job,” the coach said. “Gotta get back in the classroom,” Tannenbaum said, with a chuckle. The quarterback laughed. He knew he had aced the interview. By the end of the combine, the Dolphins had conducted 59 formal interviews. There are always hiccups in the schedule. On Wednesday night, for example, 198 players were sent to the hospital for MRIs as part of the combine’s medical check-up. All four of the Dolphins’ interviews that night were cancelled as a result. They were able to reschedule all but one for the following night. The interviews are arranged in advance, through National Football Scouting, Inc., which runs the combine. The list of players each team interviews doesn’t always have a bearing on whom they’ll draft. A team might not use up a spot on a really clean player whom they’ve already met at an all-star game, for example. Players with questions about their off-field makeup generally have a long list of interviews, sometimes just for teams to store information in case the player becomes a free agent in four or five years. There are plenty of other data points for vetting players, too. ESPN reported last week about a sports IQ test the Dolphins have been giving players at each of the last two combines, in which they are asked questions about a series of football scenarios and graded on how correctly and how quickly they answer. That test is conducted during the informal interviews, a free-for-all that resembles speed dating, where assistant coaches from all 32 teams gather in a big ballroom along with the prospects in their position group, and grab the guys they want to meet. The formal interviews are more private, more personal, more organized. The Dolphins fill their room with people because Tannenbaum is trying to build organization-wide collaboration. Part of the offseason reorganization also meant establishing a more linear chain of command. Last season Tannenbaum and former GM Dennis Hickey both reported to owner Stephen Ross. Now, Grier reports to Tannenbaum, and Gase will have final say over the 53-man roster. Tannenbaum often cites his time spent studying how the San Antonio Spurs have operated, particularly when Gregg Popovich returned to the team in the 1990s—he did so with the simple mission statement of wanting to surround himself with good people. Tannenbaum opened the Dolphins’ pre-combine meetings by saying that if he can get one thing done, it’s to create that same kind of culture. Grier and Hardegree led this formal interview, but there’s always a group post-mortem—even if it has to wait until a late-night dinner at a nearby steakhouse. There were nods of approval immediately after the quarterback’s interview on Thursday night, but no time for talking. Miami’s 18th straight player of the night was already standing outside the room, waiting to come in. The quarterback earned points with the Dolphins for being confident and prepared, and showing good recall. He could almost instantly regurgitate all the details of plays he’d run four months ago—the play call, the protection, the coverage they were expecting from the defense. But for that position, in the NFL, that’s a baseline. He performed well in this interview, but who knows if he’ll ever start a game in the NFL. And therein lies the challenge of choosing the next crop of players: Will acing a 15-minute test in a hotel room translate to competency, or better, at the next level?